Saliva contains a wide spectrum of proteins/peptides, nucleic acids, electrolytes, and hormones that originate from multiple local and systemic sources . Salivary diagnostics is least invasive when compared to oral biopsy. The pathology in the oral tissues can be detected in saliva, as it contains the exfoliated cells from the immersed tissue. Salivary markers for the detection of malignant transformation of oral potentially malignant disorders (OPMD) are noninvasive diagnostic markers and should be analyzed for efficiency as surrogate markers. Saliva itself has proteomic, enzymic, and genomic markers of which Micro RNA (miRNA) is an upcoming marker ,. MiRNA plays an important role in cellular growth, differentiation, apoptosis, and immune response, while some miRNAs aids in tumor suppression. During development of malignancy, some miRNAs are upregulated and some are downregulated, so any change in the expression of miRNAs can cause tumor suppression or act as carcinogens . Victor Ambros et al., Rosalind Lee and Rhonda Feinbaum were the first to discover miRNA . Several hundred genes in our genome encode small functional RNA molecules collectively called miRNAs and are found in normal tissues, blood, and saliva. Initially, miRNA was found to be deregulated in systemic diseases such as diabetes  and hypertension  and was later found to be deregulated in ovarian , breast , colon , liver , and pancreatic cancer tissues . During the process of development of oral cancer, certain genes acquire roles in tumorgenesis while some are tumor suppressors. Increased levels of certain miRNAs cause progression of malignancy while some suppress malignancy. Hence, they are considered human gene regulators as they are involved in gene transcription.In vitro studies on cell lines have proved the significance of miRNA as cancer signatures. Tran et al. in 2007 proposed from cell line studies of head and neck carcinoma that noncoding RNAs like miRNA play important roles in carcinogenesis . Scully et al. proved clinical and histopathological assessment of OPMD is not sufficient to predict malignant transformation, hence, assessing the miRNA in these lesions would be helpful . Cervigne et al. stated tissue expression of miRNA 21, miRNA 181b, and miRNA 345 is an early event in leukoplakia transforming into malignancy . According to the WHO, India is the second largest consumer and third largest producer of tobacco, increasing the incidence of OPMD in India which demands the researchers to involve in studies to find diagnostic biomarkers in detecting early malignant changes in OPMD. In this systematic review, various studies done in salivary miRNA as a biomarker for OPMD transforming to malignancy and in oral cancer were included in this study. Considering that there are few studies in this area, we focused on identifying the gaps in existing studies to suggest areas for future research on salivary miRNA as a potential target in detection of early malignancy in OPMD. To explore the potential role of miRNAs as biomarkers to detect early malignancy in OPMD. For this systematic review, MeSH terms were used to search the PubMed data base, Science Direct and a manual search was done, and studies from 2005 to 2016 were included in this study. MeSH terms for key words (1) leukoplakia, (“Oral leukoplakia,” “Oral leukoplakias,” “leukoplakia,” “leukoplakias,” “leukoplakic lesions,” “leukoplakic lesion,” “lesion, Leukoplakic,” “lesions, leukoplakic,” “leukokeratosis,” “oral leukoplakic lesions,” “oral leukoplakic lesion,” “oral leukokeratosis,” “oral leukokeratoses,” “oral keratosis”) (2) oral submucous fibrosis (oral submucous fibrosis,” “oral submucous fibroses,” “submucous fibrosis,” “submucous fibroses,” “submucous fibrosis, oral,” “submucous fibroses, oral) and (3) oral lichen planus (oral lichen planus,” “lichen planus,” “lichenoid eruption”) along with salivary miRNA (mirnas” OR “mirna” OR “primary microrna” OR “pre m rna” OR “small temporal rna” OR “sirna” OR “pri mirna” OR “pre mirna” OR “primary mirna” OR “primary mi rna” OR “primary micro rna” OR “primary microrna” OR “rna, micro” OR “mi rna” OR “mirna” OR “micro rna” OR “microrna”) and malignant transformation were used to retrieve studies on salivary miRNA in OPMD and oral cancer. Studies on expression of salivary miRNA in oral cancer. Around 574 articles were recovered from the web search, of which 197 were located after applying the human filter. Two articles were added from hand searching, for a total of 199. After applying the inclusion and exclusion criteria, 174 articles were excluded. Twenty four articles were obtained after screening the title. One article was excluded because the full text was not in English. Seventeen of the remaining twenty-three articles were done in tissue or serum samples of OPMD and oral cancer. 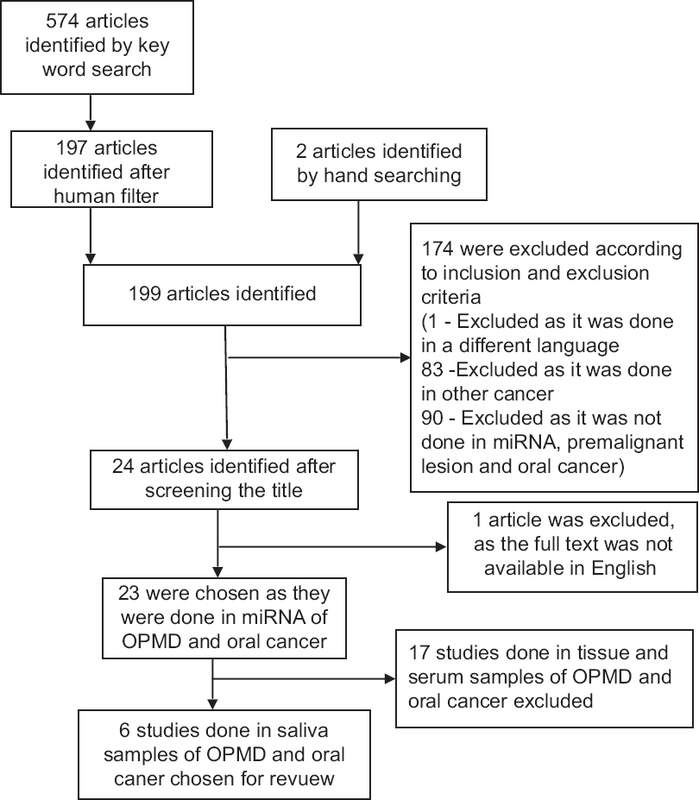 A total of six articles, done in saliva samples of OPMD and oral cancer, were included in this systematic review [Figure 1]. The selected studies were evaluated by two editors after a data extraction table was developed. It captured the year of study, number of samples, and group methodology for the evaluation of miRNA, the place of the study, mean and standard deviation, cutoff values, sensitivity and specificity, and details related to statistical analysis [Table 1]. 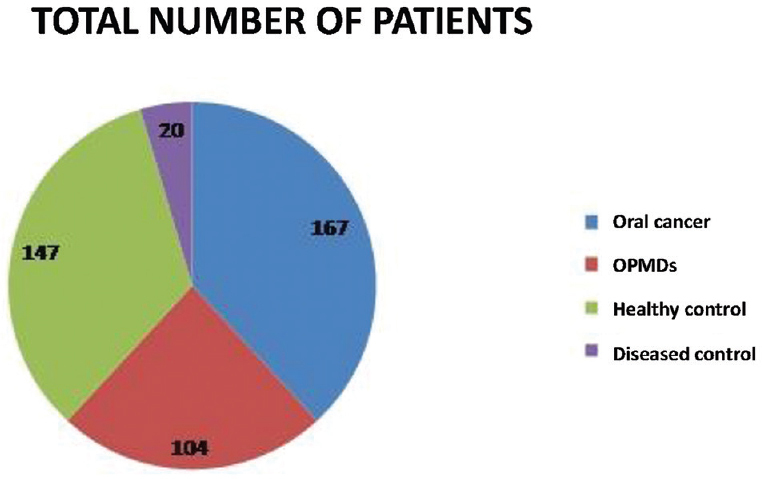 The number of samples analyzed for the expression of miRNAs in each case of OPMD and oral cancer is illustrated in [Figure 2]. One of the six studies was done only in OPMDs, two studies were done in both OPMD and oral cancer, and three studies were done only in oral cancer. The quality of these six studies was assessed using the Quality Assessment of Diagnostic Accuracy Studies (QUADAS)-2 tool. This tool includes 14 items which assess the risk of bias and sources of variation in diagnostic studies. It is recommended by the Cochrane Collaboration, Agency for Health Care Research and Quality and the UK National Institute of Health and Clinical Excellence to assess the quality of diagnostic studies. QUADAS-2 is an improvised redesigned tool from the Cochrane Collaboration based on feedback from editors of the original QUADAS tool . QUADAS-2 has four domains, patient sampling, index test, reference standard, and flow and timing. 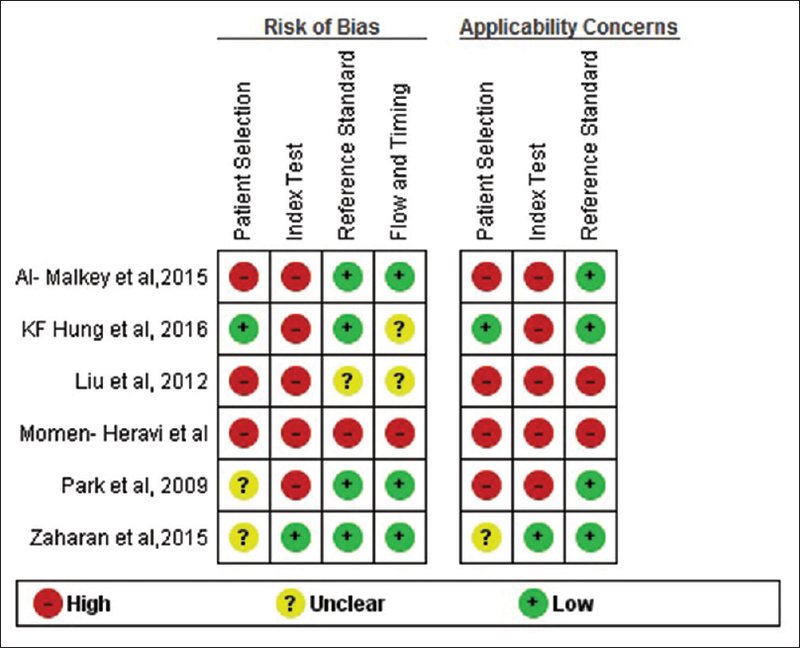 Each domain consists of two to four questions answered “yes,” “no” or “unclear.” This data were fed into Review Manager software (Revman 5.3) to obtain a color-coded chart of the risk of bias and applicability concerns [Figure 3] and [Figure 4]. The study of Zahran et al. had the lowest risk of bias of the six studies, while the three studies of Liu et al., Momen-Heravi et al., and AI–Malkey et al. had high risks of bias. The two studies of Park et al. and Hung et al. had moderate risks of bias. The low-risk bias study revealed upregulated miRNA 184 and miRNA 21 and downregulated miRNA 145 had statistically significant area under the curves (AUCs), proving the need for further focus on these markers in various populations in various dysplastic cases of potentially malignant disorders. Examination of saliva has emerged as a noninvasive technique in identifying various biomarkers for systemic diseases such as cardiovascular diseases  and diabetes  and oral diseases such as periodontitis . In 2009, salivary miRNA was first investigated as a viable marker for oral carcinoma . Various diagnostic studies on the expression of miRNA proved it was deregulated in the tissue ,,,, and serum , of patients with oral carcinoma. The studies in this systematic review mainly focused on the evaluation of the potential of salivary miRNA in diagnosing early malignancy in OPMD. Two studies by Momen-Heravi et al. and Zahran et al. proved miRNA 27b, miRNA 145, miRNA 181, and miRNA 21 had statistically significant sensitivity and specificity [Table 1] to detect early malignancy ,. The study by Hung et al. mentioned the sensitivity , the study of Liu et al. mentioned only the specificity  and the studies of Park et al. and Al-Malkey et al. did not mention either the sensitivity or specificity of the markers. [Table 1]. Momen-Heravi et al. reported the overexpression of miRNA 27b and miRNA 24 in the saliva samples of patients in remission from oral squamous cell carcinoma (OSCC) . Only one study, by Hung et al. in 2016, compared saliva samples with tissue samples and concluded that saliva samples were significantly better for predicting malignancy than tissue samples and miRNA 31 is a significantly better marker for predicting malignancy than miRNA 21 in saliva samples of OPMD . A clear description of the saliva collection method was not given in one study  while in other five studies ,,,,, unstimulated whole saliva was collected from the floor of the mouth, before which participants refrained from drinking, eating, and oral hygiene measures. RT-qPCR was used to quantify salivary miRNA in all studies ,,,,,. These studies were done in saliva samples of 167 oral squamous cell carcinoma, 78 OPMD, 147 healthy controls, and 20 disease (aphthous stomatitis) controls. These studies proved that 5 miRNAs, miRNA-31, miRNA-24, miRNA-27b, miRNA-21, and miRNA-184, are upregulated and 15 miRNAs, miRNA-200a, miRNA-125a, miRNA-11, miRNA-191, miRNA-136, miRNA-147, miRNA-1250, miRNA-632, miRNA-646, miRNA-668, miRNA-877, miRNA-503, miRNA-200a, miRNA-323-5, and miRNA-145, are downregulated in OSCC compared with healthy controls [Table 1]. A total of 11 miRNAs that were deregulated in OSCC were also found to be deregulated in OPMD compared with healthy controls ,,,. Only Zahran et al. compared disease controls (aphthous stomatitis) with healthy controls and found no difference between them . Three studies found that miRNA 31 [28-30] and two studies found miRNA-21 , were elevated in OSCC. These 6 studies were done in Caucasian, Asian, African, Taiwanese, Iraqi, and Arabic populations, proving the need for exclusive studies in the Indian populations to assess the diagnostic and prognostic value of miRNA in OPMD ,,,,,. 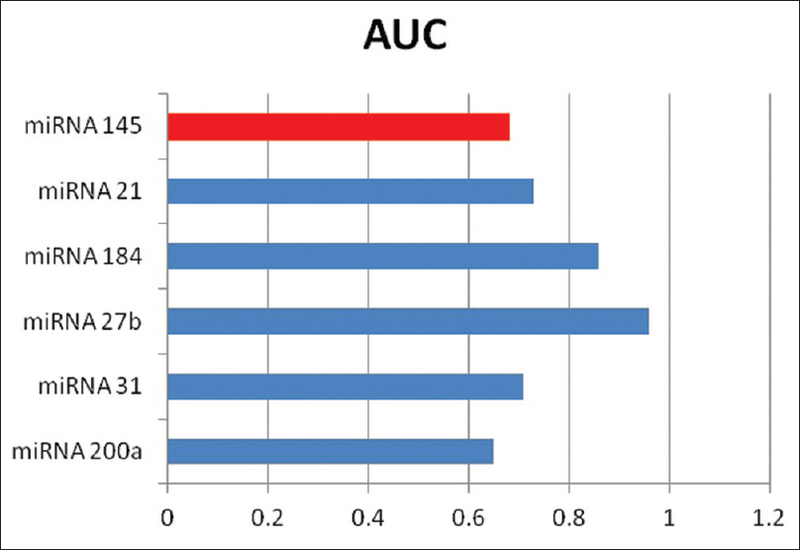 The AUC curve shows miRNA 27b is the marker of choice in OSCC . However, the Zahran et al. study with a low risk of bias had a predetermined cutoff value for the miRNA before the onset of the study. In their study miRNA 184 had the maximum sensitivity and specificity [Figure 5]. They also reported that upregulated miRNA 21 and downregulated miRNA 145 are markers for detecting OPMD with dysplasia, OPMD without dysplasia and OSCC . These findings give insight on the possible use of salivary miRNA as a biomarker in assessing early malignancy in OPMD. Long-term follow-up studies with several population clusters can enhance the reliability of salivary miRNA as a biomarker. The four studies done in OPMD studied expression of miRNA in cases of leukoplakia, lichen planus, OPMD with dysplasia, and OPMD without dysplasia, but cases of oral submucous fibrosis were not mentioned in any of the studies [26-29]. There is need for studies in oral submucous fibrosis and for more studies comparing salivary miRNA with tissue and serum miRNA. Studies in the Indian population are needed to understand specific genetic variations when evaluating saliva as a surrogate marker in detecting early malignancy. Studies with longer follow-up of saliva samples after the treatment for OPMD and OSCC could enhance the prognostic value of salivary miRNA. In this systematic review, considering the results of low risk of bias diagnostic study as determined by the quality assessment tool, the upregulated salivary miRNA 184, and miRNA 21 and downregulated salivary miRNA 145 can be used as potential biomarkers to predict malignancy. Of these three, salivary miRNA 184 had highest sensitivity and specificity with an AUC of 0.86 in detecting early malignancy. However, the overall quality of evidence is low in the available literature. There is need for more studies to prove the diagnostic and prognostic potential of salivary miRNA, especially in countries like India where there is an increased prevalence of OPMD. The authors would like to thank Saveetha Dental College, Saveetha Institute of Medical and Technical Sciences. Chianeh YR, Prabhu K. Biochemical markers in saliva of patients with oral squamous cell carcinoma. Asian Pac J Trop Dis 2014;4(Suppl 1):S33-40. Cheng YS, Rees T, Wright J. A review of research on salivary biomarkers for oral cancer detection. Clin Transl Med 2014;3:3. Jansson MD, Lund AH. MicroRNA and cancer. Mol Oncol 2012;6:590-610. Sassen S, Miska EA, Caldas C. MicroRNA: Implications for cancer. Virchows Arch 2008;452:1-0. Chung AC. MicroRNAs in diabetic kidney disease. Adv Exp Med Biol 2015;888:253-69. Marques FZ, Charchar FJ. MicroRNAs in essential hypertension and blood pressure regulation. Adv Exp Med Biol 2015;888:215-35. Iorio MV, Visone R, Di Leva G, Donati V, Petrocca F, Casalini P,et al . MicroRNA signatures in human ovarian cancer. Cancer Res 2007;67:8699-707. Yen MC, Shih YC, Hsu YL, Lin ES, Lin YS, Tsai EM,et al . Isolinderalactone enhances the inhibition of SOCS3 on STAT3 activity by decreasing miR-30c in breast cancer. Oncol Rep 2016;35:1356-64. Mullany LE, Wolff RK, Herrick JS, Buas MF, Slattery ML. SNP regulation of microRNA expression and subsequent colon cancer risk. PLoS One 2015;10:e0143894. Perilli L, Pizzini S, Bisognin A, Mandruzzato S, Biasiolo M, Facciolli A,et al . Human miRNome profiling in colorectal cancer and liver metastasis development. Genom Data 2014;2:184-8. Lau C, Kim Y, Chia D, Spielmann N, Eibl G, Elashoff D,et al . Role of pancreatic cancer-derived exosomes in salivary biomarker development. J Biol Chem 2013;288:26888-97. Tran N, McLean T, Zhang X, Zhao CJ, Thomson JM, O'Brien C,et al . 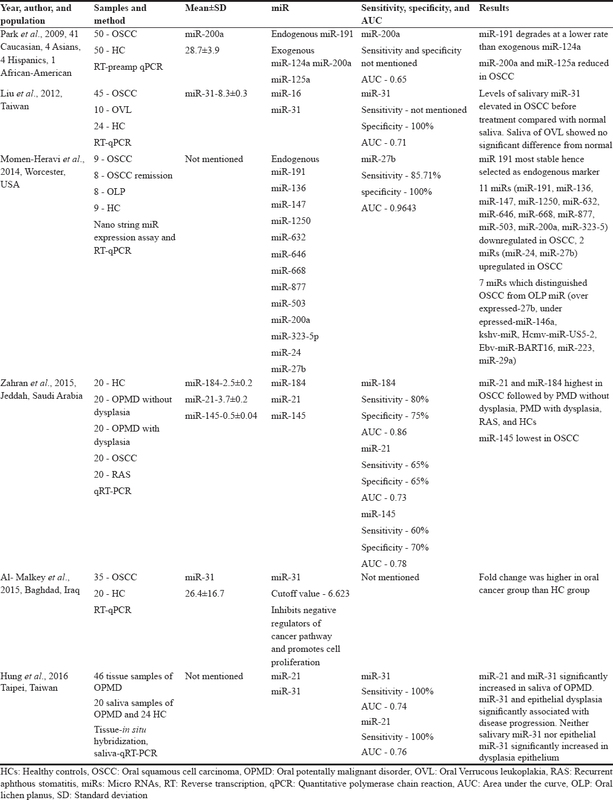 MicroRNA expression profiles in head and neck cancer cell lines. Biochem Biophys Res Commun 2007;358:12-7. Scully C. Challenges in predicting which oral mucosal potentially malignant disease will progress to neoplasia. Oral Dis 2014;20:1-5. Cervigne NK, Reis PP, Machado J, Sadikovic B, Bradley G, Galloni NN,et al . Identification of a microRNA signature associated with progression of leukoplakia to oral carcinoma. Hum Mol Genet 2009;18:4818-29. Whiting PF, Rutjes AW, Westwood ME, Mallett S, Deeks JJ, Reitsma JB,et al . QUADAS-2: A revised tool for the quality assessment of diagnostic accuracy studies. Ann Intern Med 2011;155:529-36. Kosaka T, Kokubo Y, Ono T, Sekine S, Kida M, Kikui M,et al . Salivary inflammatory cytokines may be novel markers of carotid atherosclerosis in a japanese general population: The Suita study. Atherosclerosis 2014;237:123-8. Srinivasan M, Blackburn C, Mohamed M, Sivagami AV, Blum J. Literature-based discovery of salivary biomarkers for type 2 diabetes mellitus. Biomark Insights 2015;10:39-45. Miller CS, King CP Jr. Langub MC, Kryscio RJ, Thomas MV. Salivary biomarkers of existing periodontal disease: A cross-sectional study. J Am Dent Assoc 2006;137:322-9. Park NJ, Zhou H, Elashoff D, Henson BS, Kastratovic DA, Abemayor E,et al . Salivary microRNA: Discovery, characterization, and clinical utility for oral cancer detection. Clin Cancer Res 2009;15:5473-7. Hung PS, Liu CJ, Chou CS, Kao SY, Yang CC, Chang KW, et al. MiR-146a enhances the oncogenicity of oral carcinoma by concomitant targeting of the IRAK1, TRAF6 and NUMB genes. PLoS One 2013;8:e79926. Li J, Huang H, Sun L, Yang M, Pan C, Chen W,et al . MiR-21 indicates poor prognosis in tongue squamous cell carcinomas as an apoptosis inhibitor. Clin Cancer Res 2009;15:3998-4008. Soga D, Yoshiba S, Shiogama S, Miyazaki H, Kondo S, Shintani S,et al . MicroRNA expression profiles in oral squamous cell carcinoma. Oncol Rep 2013;30:579-83. Avissar M, Christensen BC, Kelsey KT, Marsit CJ. MicroRNA expression ratio is predictive of head and neck squamous cell carcinoma. Clin Cancer Res 2009;15:2850-5. Maclellan SA, Lawson J, Baik J, Guillaud M, Poh CF, Garnis C,et al . Differential expression of miRNAs in the serum of patients with high-risk oral lesions. Cancer Med 2012;1:268-74. Yang CC, Hung PS, Wang PW, Liu CJ, Chu TH, Cheng HW,et al . MiR-181 as a putative biomarker for lymph-node metastasis of oral squamous cell carcinoma. J Oral Pathol Med 2011;40:397-404. Momen-Heravi F, Trachtenberg AJ, Kuo WP, Cheng YS. Genomewide study of salivary microRNAs for detection of oral cancer. J Dent Res 2014;93:86S-93S. Zahran F, Ghalwash D, Shaker O, Al-Johani K, Scully C. Salivary microRNAs in oral cancer. Oral Dis 2015;21:739-47. Hung KF, Liu CJ, Chiu PC, Lin JS, Chang KW, Shih WY,et al . MicroRNA-31 upregulation predicts increased risk of progression of oral potentially malignant disorder. Oral Oncol 2016;53:42-7. Liu CJ, Lin SC, Yang CC, Cheng HW, Chang KW. Exploiting salivary miR-31 as a clinical biomarker of oral squamous cell carcinoma. Head Neck 2012;34:219-24. Al-Malkey MK, Abbas AA, Khalf NF, Mubarak IA, Jasim IA. Expression analysis of salivary microRNA-31 in oral cancer. Int J Curr Microbiol Appl Sci 2015;4:375-82.